Back are all our favorite denizens of a Georgian townhouse in Edinburgh. Bertie the immensely talented six year old is now enrolled in kindergarten, and much to his dismay, has been clad in pink overalls for his first day of class. Bruce has lost his job as a surveyor, and between admiring glances in the mirror, is contemplating becoming a wine merchant. Pat is embarking on a new life at Edinburgh University and perhaps on a new relationship, courtesy of Domenica, her witty and worldly-wise neighbor. McCall Smith has much in store for them as the brief spell of glorious summer sunshine gives way to fall a season cursed with more traditionally Scottish weather. 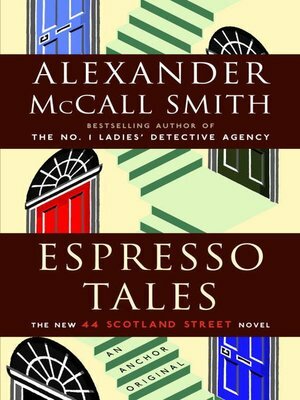 Full of McCall Smith's gentle humor and sympathy for his characters, Espresso Tales is also an affectionate portrait of a city and its people who, in the author's own words, "make it one of the most vibrant and interesting places in the world."